Less is more: Man the Lifeboats! The captain and crew of the USS Empire, incompetent and blind drunk on bubbles, have run the mighty ship headlong into an immovable reef. It was what can only be called a very ‘timely’ accident, beautifully synchronized with a pirate-like escape whence they abandoned the wreck completely unscathed, leaving the passengers behind but taking along a good share of the gold stowed below. Still not disclosed is that the reef was in plain sight for anyone who cared to look through the scope and see what lie in wait a few miles ahead. The danger was in fact made known by many clear-eyed deck hands who tried to sound the alarms and change course; they were dubbed pessimists, crackpots and nonbelievers, and promptly thrown overboard. The designers, engineers and financiers of the Empire decided it best to leave off the sonar, radar and warning systems, ever trusting in the Great and Omniscient ‘Invisible Hand’ to unfailingly guide the giant ship through any and all conditions. Anything but complete and total faith in The Hand was heresy. At the height of religious fervor in their cult-like belief system, the fanatics convinced themselves that to install safeguards would only demonstrate their lack of faith, anger their God, and beckon disaster. “Full speed ahead!” barked the owners of Empire, Inc. “The Empire transports the factories of a globalized Free Market which will bring Freedom and Democracy to all shores!” The true believers among the crew and passengers pumped their fists and repeated Empire’s mission statement without a second thought. So blind and unguided, she raced full throttle into uncharted waters with self-deluded madmen at the helm. If that weren’t enough, the Invisible Hand was an absentee manager in the second half of 2008, just when the Empire needed Him most. Perhaps He was busy battening down hatches in Latin America where nationalistic typhoons pounded His fledgling FreeMarkets™. Or maybe He was busy writing checks to theright wing death squads that spread His Word and convert the heathens of the uncivilized world. Maybe He just doesn’t care. Who are we to question?… Mr. Hand works in mysterious ways. So just as the captain was re-broadcasting his pitifully hysterical “All is Well” PR pitch from the seemingly invincible superstructure, the Empire struck that reef called reality with a jarring kerrang! and a metallic screech heard ’round the world. Instantly, the underbelly of the good ship was ripped open, creating what could well be a fatal wound to the Empire as water pours in by the tons per second. The shock of the impact also dislodged vital steerage mechanisms and severed fuel lines below, setting the engine room ablaze. This is the state of the USS Empire today. Despite the better judgment of the realists who see water cresting the rails, the interchangeable captains and their yes-men crews have been instructed to patch the holes and put out the fires, for the financiers are as always in charge, commanding from their hedges a safe distance away. It’s a battle the crew cannot win, but to the shipmasters it matters not: the passengers that remain captive will do the bailing and be the only ones to go down with the ship. The financiers’ investments are always covered first, regardless how outrageous their gambles, how criminally fraudulent their covert schemes, or how minimal their own skin in the game. The sane people and pragmatists know that now is the time to head for the lifeboats and set out on rough water in small, manageable groups of similarly sane people. They will row toward the safety of shore as the totaled behemoth slips to the ocean floor taking with her all those who stayed aboard trying to fill cavern-sized leaks and extinguish raging fires with nothing but bales of paper. 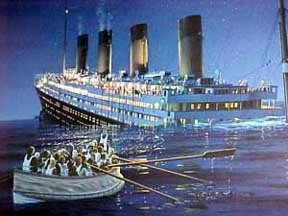 Those lifeboats are our real hope and the future of our economy. They are our small towns and cities, family farms, small- to medium-sized businesses, and genuine artists. But they are in severe disrepair due to neglect and 30-years of concerted attacks by the parasitic neo-colonialists who do not create, grow, build, repair, or do, but simply skim the profits from the wage slaves who actually do the work and create real wealth. It is imperative that we begin the task of restoring these valuable assets as the collapse of global credit and declining energy supplies will dictate that we live more locally, on real wealth instead of bank issued debt. The current mission of patching the holes on the sinking ship is a fool’s errand. Our national debt is $11 trillion; Obama will add another $1.3 trillion this year alone. Total national debt including unfunded entitlements is $54 trillion, or $176,000 per citizen, four times GDP. The derivatives bubble is maybe $1.2 QUADRILLION — a number once used only by astrophysicists and computer scientists (granted, it’s all fictional computer wealth, but the banksters still think it is their due). Meanwhile, personal savings, banks, businesses, and governments are all in the red. In short, this country is as broke as the 1980’s Soviet Union, and now we’re voluntarily getting bogged down in Afghanistan! You’ve gotta wonder if anyone in Washington has ever read a history book. So, the brainiacs in the WH and Pentagon are currently escalating the war in the country known as the “Graveyard of Empires”, drone-bombing nuclear Pakistan, and ratcheting up the rhetoric against Iran, all while the first bloody quagmire staggers forth for reasons that even the military cannot say. Aside from the fact that this blatant attempt to control MidEast oil and gas supplies will probably initiate a hot war with Russia and China, we simply cannot pay for any more wars. Economies are like governments in that both exist only to serve the people. When they become corrupt, they work in reverse, acting together to siphon money and power upward to a small circle of elites while forcing the rest of us into a race to the bottom… precisely what we are seeing today. These bank bailouts are not about saving your job, they are about making the banksters richer and more powerful, while preserving their rotted system that works for the few while leaving the bulk of humanity starving or eternally struggling. So for once, the majority of the world can agree with the ‘free trade’ neoliberals (aka neoconservatives with more discreet wars): ‘Let the markets sort it out.’ Let the insolvent banks and failed businesses go under. Let the currency traders, World Bankers and GovCorp stooges set out without the other 99% of us to rebuild their lunatic ship and fight the wars they start. Then we’ll see just how quickly a war can be stopped, and how few new ones will be waged. To get out of this jam — and this is key — we also need to wrap our heads around the fact that money is purely imagined wealth; that is, wealth that exists only in our minds and nowhere else. To illustrate, here’s an alternative bail out plan: We run the money presses at full speed for a year, printing nothing but new 1,000, 5,000 and 10,000 dollar bills (I suggest these notes bear the faces of Maestro Greenspan, NAFTA Willy, and the perma-smirking Little Bush, respectively). With our new ‘money’, we bail out every corporation and small business, and we throw in two years worth of operating costs. We monetize the toxic assets held by the banks to re-inflate their hallucinated value, and we pay off every mortgage and loan, plus full-term interest to the banks. Additionally, we cut every citizen a check for $10million, free and clear. Voila, everyone is debt free and ‘rich’! If money were real wealth, this would be a sound plan. But it’s not, so it’s not. Obama’s ‘financial team’ consists of the very same banksters who engineered this meltdown and are yet again profiting from their scams (deregulation, ‘too big to fail’ M&As, hoax derivatives, Ponzi scheme securities, fraudulent loans). They continue to loot the treasury, create money out of thin air, and pile on more debt. They also want to re-inflate the real estate and derivative bubbles when what needs to happen, and eventually will happen, is for these assets to return to their actual market values — in many cases zero — not dumped at face onto future generations! Geithner & Co. are saving their cronies in the big banking houses so the incompetent, corrupt banks can buy up the small, solvent ones. Backasswards. This is exactly the opposite of how capitalism is supposed to work. It’s all completely insane, and clearly making things worse, not better (the DOW continues its death spiral with no bottom in sight). But what should we expect? We reside in Bizarro World where millionaires are legitimately the middle class. Ergo, they are now being crushed as well. Crushing the middle class is the only thing that Corporate America and their D.C. accomplices are competent at anymore. Millions of newly poor pave the way for a new class of mega-rich with net worths the size of national GDPs. They now circle like vultures, waiting for the bodies to hit the ground so they can swoop down and buy up real estate, businesses, natural resources, public lands, infrastructure and prisons(!) for pennies on the dollar. Once they do, they intend to start another ‘business cycle’ with the ferocious power of a corporatist state, or what Mussolini named Fascism. Never again! It is imperative and urgent that we finally abandon this irreparable ship and its fools and start fixing up the life boats. This will be THE opportunity of the 21st century for those who are seeking careers in the most uncertain time in memory. Our revitalized and relocalized human-scaled economies will not birth global bubbles. They will not spawn viral speculators or provide safe harbor to predatory capitalists. They will not produce multi-billionaires or legions of wage slaves. They will not create hallucinated wealth that exists only as digital data on the globalists’ computer networks. And they will not permit bankers to charge 30% interest — plus ‘fees’ — on loans made to people who work three crap jobs but still can’t afford quality food or basic health care. The new economy will however, give rise to real, tangible wealth: clean air and water, healthy food, textiles, useful technology, and functional families and strong communities. They will create jobs that contribute to the culture and are worth having — not just for the pay — but for meaningful occupation and participation in creating something for the greater good. We will have walkable towns, tighter communities, healthier children, and reduced crime rates. Unique architecture will replace the monotonous corporate boxes that make one town indistinguishable from the next. Urban farms and parks will replace acres of asphalt parking lots, and the super stores that export worker wealth to Wall Street will give way to businesses that pay living wages and reinvest locally. The inescapable marketing din of consumer culture will be lowered to a tolerable background level, allowing people enough mental space to create uncorrupted ideas, art and a culture of their own. This will be a world worth caring about, hence warmongering, mass murder and eco-cide will no longer be fashionable or politically expedient. As the infotainers and the Beltway puppets of power warn of a new socialism (it’s not), will any of them dare point at the elephant standing in the middle of the room? That is, who got us here, how, and why? Or that the entire debt-based monetary system is inherently corrupt and patently unsustainable, thus saving it is the last thing we ought to do? This needs to be made known as soon as possible so that our last resources are directed to building something entirely new and workable, from the ground up. If we only look on the other side of the coin, we see that this ‘crisis’ is really is an incredible opportunity. Humanity has a chance to rebuild a sane society that does not depend upon a planet killing, suicide-pact economy. As we refurbish our life boats we must also lash them together, creating ties of trade, culture and open source innovation between strong, sustainable communities. This new system is not new at all, but a return to an economy that is deglobalized and decentralized, sovereign, autonomous and human scaled. It is an economy that works as any sustainable economy must: for everyone that participates. I have no delusions that this transition will be easy or painless; I simply see it as inevitable, and healthy in the long run if we use the opportunity to start over with the finite natural capital stocks and real interests of humanity in mind. If you’re interested in working on the life boats, throw me a line. This looks to be a permanent growth industry. Stay tuned for more dispatches from the USS Empire and opinions from divergent voices on how to create a sane economy that works for the masses… the ultimate goal of this project. That was an awesome post. A couple days ago I wrote a letter to my boss that said in part, "this rat is jumping ship". I love the lifeboat analogy. You bet. I think that we will be happy to follow the rats if (or when) the ship really starts taking on water.